Can Pakistan learn from Katrina? The hurricane hit a developed country and impacted just over 400,000 people and they have yet to recover. How will Pakistan? This weekend, as my home state of Mississippi prepares to memorialise the five-year anniversary of America’s worst natural disaster, Pakistan will mark a month since the start of the floods. Because of this post-Katrina milestone and my upcoming travels to Karachi, I’ve been considering the scope and response to both of these catastrophes. The two floods have superficial similarities, despite the fact that Hurricane Katrina was a smaller event in a better-equipped country. This means that on the fifth anniversary of Pakistan’s worst natural disaster, things will probably look even less rosy than they do now in New Orleans. Hurricane Katrina formed over the Bahamas on August 23, 2005, clipping the southern tip of Florida before making a second landfall on August 29, seventy miles southeast of New Orleans—Louisiana’s biggest city, with a pre-storm population of 454,863. With winds of 205 kph, the hurricane was strong enough to breach levees surrounding the city. So far these floods have displaced 20 million Pakistanis and geographically altered over 20 per cent of the country. Four weeks in, the floods are less predictable than Katrina and the relentless rain continues to disrupt aid in a country with shaky infrastructure to begin with. Moreover, the Taliban are worsening the situation by threatening international aid workers. Katrina victims were hungry, dehydrated, terrified and stranded, and at some point the city operated under a dangerous, semi-authorised version of martial law, but within a week, all survivors were rescued. And while a handful of people died from cholera-related diseases, there was scant fear of waterborne epidemics. In Pakistan however, these diseases are genuine threats. According to Boston University’s Adil Najam, aid has only reached 5 million victims, while 6 million remain in life-threatening conditions and 2 m still need temporary shelter. Both Katrina and the Pakistani floods have devastated areas that were already struggling politically and financially. Both floods have suffered looting and riots and both New Orleans and Pakistan owe a degree of suffering to resource mismanagement. 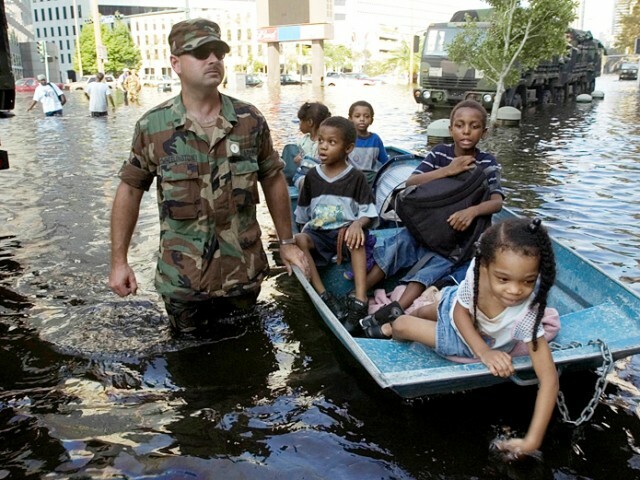 Pre-Katrina New Orleans was flush with political corruption, violence and racial tension. Just as dam-building projects have been consistently delayed for over five decades in Pakistan’s conflict-ridden north, a year prior to Katrina New Orleans’s levees were tested and the city was warned. But federal funds were diverted from relevant projects. Neither country’s president seemed to realise the cataclysmic nature of things. Or at least, neither of them bothered to cancel vacations in order to personally oversee relief efforts. Just as Asif Ali Zardari couldn’t be bothered to abandon his European hotels and dignitaries, President Bush planned a trip in the final days of August 2005, despite advance notice that Katrina was coming. He witnessed the destruction from his jumbo jet four days after the storm. And in both cases, religious organisations—extremist or not—were among the first responders. On the Mississippi Gulf Coast, church groups were able to avoid bureaucracy, distributing resources long before refugees crossed paths with government officials. For me, it’s a lens through which to grasp Pakistan’s latest predicament. But it also illustrates the gravity and aftermath of these floods, particularly if the international community doesn’t take action and if the Pakistani government repeats the Bush Administration’s mistakes. Only about 4 per cent of proffered aid was accepted, most of it cash—and much of that, diverted to NGO’s. It seemed Bush’s America was in the business of broadcasting strength rather than vulnerability, and both American citizens and America’s international image suffered for this understandable but misplaced hubris. So kudos to Pakistan for finally accepting aid from India, and kudos to India and other donors for demonstrating that a stable, healthy Pakistan is in everyone’s interest—whether Pakistan views you or your government as friend or foe. At some time, every country will experience disaster and vulnerability. Let’s hope the international community, the Pakistani government realise this. A graduate of Columbia University’s Journalism School and fellow for The Express Tribune. She writes about art and culture for Juxtapoz magazine and blogs at chereefranco.wordpress.com. This flood is more dreadful then katrina, we have lost so many things in this terrible incident, But i must say we should have some cautions from the govt dept, But everyone knows about our wonderful and helpful govt. The comparison is eery. From unbuilt dams, to a population that is largely marginalized and response from leadership. The big difference of course is that Katrina hit a city and these floods have inundated an entire country.